It's that time again! Time for renewal, transformation, and repentance. A time for great sacrifice and also great hope! 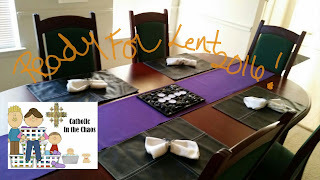 I love the Lenten season so much, I cannot fully put into words what it means to me. For years my Lenten experience was very personal and to some extent it still very much is. Yet now I'm a wife and mother and my vocation expects me to share more of myself than was ever required before marriage. All the moms reading this understand what I'm talking about. Motherhood is a daily martyrdom to oneself. We are constantly giving and sacrificing and doing, and working, and so on and so forth. Most days, especially mothers with little ones or those with children who have special needs, are tired, no, exhausted, barely able to open our eyes in the darkness of the morning when our youngest cries out. But we do it. We get up and the dying to ourselves begins again. Lent is another one of those great sacrifices for mothers and fathers. We desperately want and need to be refreshed and renewed in the blood of the lamb. But we are also spending all of our free time with our family, in the noisy hustle and bustle that child rearing is. How hard it is to find any time for silence and listening to the voice of our Lord! How difficult it becomes to really participate in the Lenten process in order to make the transformation we desperately need! 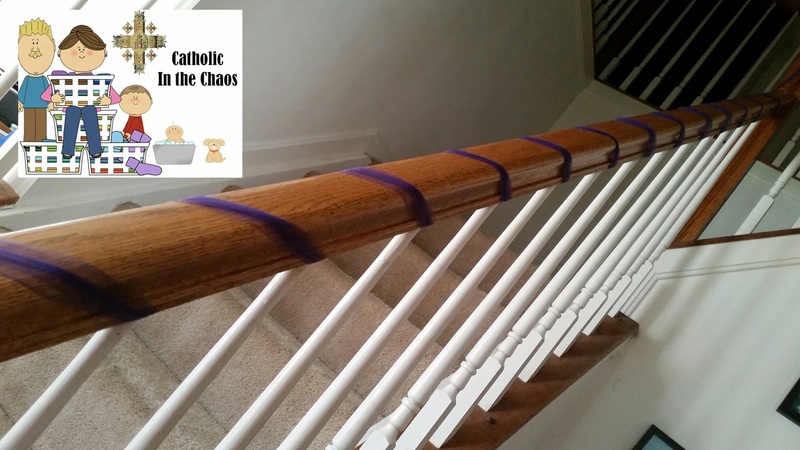 That is why, for me, preparing my house for Lent is more than necessary. I need to be reminded on a daily basis of the liturgical season in which we are currently. I need that visual to make me stop and be present in the many moments of sacrifice a day so I don't waste any suffering, any penance, any sacrifice or annoyance. I need my eyes to tell my brain over and over again to "offer it up". I also need these decorations to illustrate to my children that this time of the year is a very very special time and different than any other time of the year. So this is the motivation behind decorating my house for Lent. It's not for the purpose of enhancing beauty but to bring us all closer to the Lord. This is how I prepared for Lent this year. The picture at the top of this post shows our dining room table. I just added a purple runner and this cross centerpiece for our family dinners. 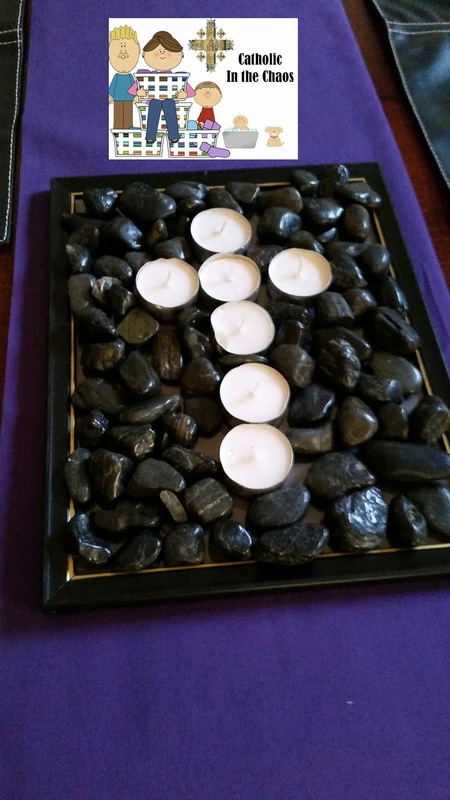 I made this centerpiece by using an old picture frame ( I added a black piece of construction paper inside of the frame just to give it a black background) with simple black rocks (I actually found in the aquarium area at Walmart), and votive candles that I bought at a thrift store. My plan is to begin by lighting each candle nightly at dinner and as the weeks get closer and closer to The Passion of Christ we will blow out one candle each week. This is a visual way to show my children that the "Light of the World" was extinguished from this material world on Good Friday. A friend of a friend came up with this idea and I thought it was perfect for my family. I'll share pictures of what we will do to celebrate the Easter season when that time comes. 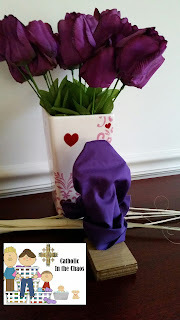 I placed some plastic purple flowers (I bought 4 stems at $.97/each a few weeks ago!) around the house in a few places just as another reminder of this beautiful time repentance. Seven feet of purple tule I purchased for less than a dollar. I simply wrapped it around the staircase so that we are greeted with a sign of Lent as soon as we walk into our front door. Covering our crucifixes was the hardest thing for me to do. How I miss seeing my Jesus' face when I pray to Him! But I knew I needed to do it, for myself and my family. All the purple cloth was purchased for about $7 total. I simply cut it up to use to cover my crucifixes and as my dining room table runner. 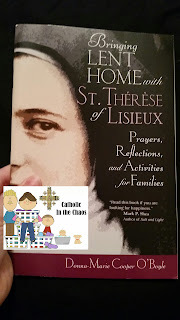 This is a beautiful Lenten meditation book we are going to read and follow daily as a family during Lent. It is written by Donna-Marie Cooper O'Boyle (there is a Lenten sale going on right now and you can get four of these meditation books for $11 at this link). She has numerous ones for various saints. I purchased the ones with St. Pope John Paul II, Bl. Mother Theresa and this one above with my lovely Little Flower, St. Terese of Lisieux. Saints during this Lenten time. 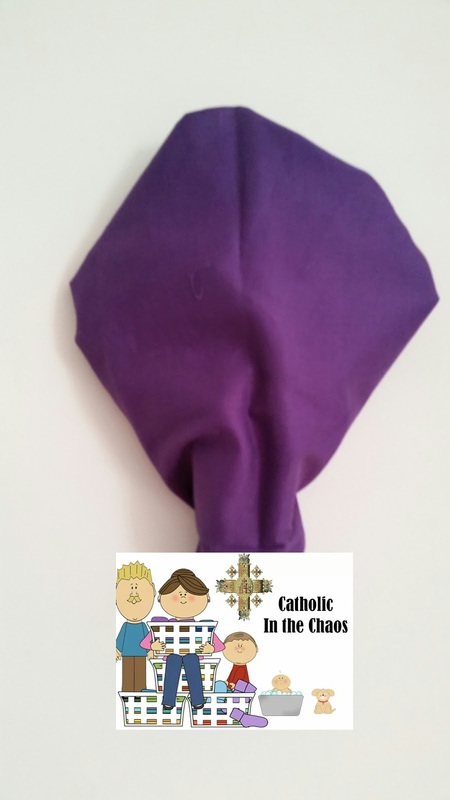 So that's how we have prepared ourselves for Lent 2016! I would love to hear your ideas as well.